NEW ORLEANS (press release) – The Joy Theater has announced that it will unveil new interior cosmetic renovations to further optimize its patron experience and on-site event capabilities. AEG Presents (who acquired operating rights to the theater in 2017) has invested capital for site renovations, including upgrades to the lobby, main concert hall, hospitality spaces, dressing rooms and guest amenities. 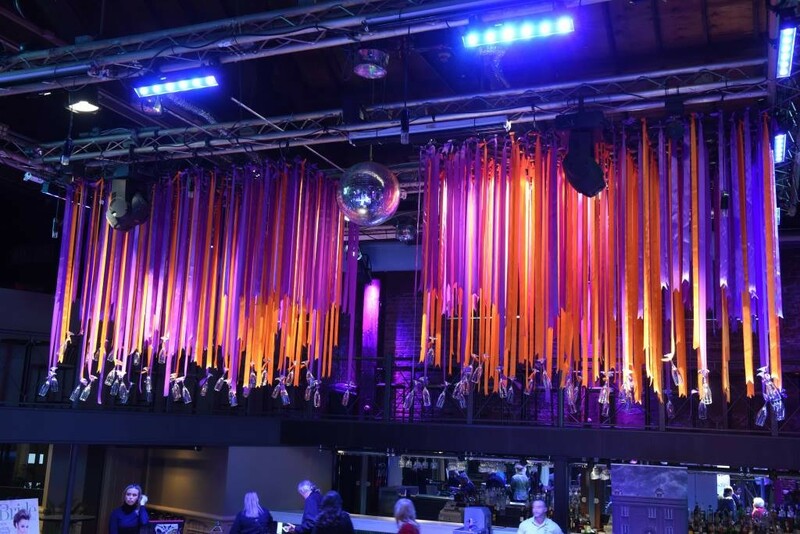 The venue – now operated by Winter Circle Productions (WCP), an AEG Presents (AEG) company – hosts over 100 events annually and currently serves as a music and comedy venue, theater for film screenings, and private event space for receptions, meetings, awards ceremonies and lectures. The 10,000-square-foot multipurpose venue features a state-of-the-art audio and visual system, fixed stage, three permanent bars, a multi-tiered balcony and flexible seating plans that can be configured in limitless ways to support corporate, brand or social events.  New acoustic treatment in main theater to enhance sound.  New sound system (featuring d&amp;b Audiotechnik Vi8 Line Array speakers).  New bars and bar finishes.  Updated paint and wall treatment in venue lobby and balcony.  New lighting fixtures throughout venue.  Theater/main hall curtain track.  New custom backlit stage proscenium. Located in downtown New Orleans on Canal Street and with a capacity of 1,200 patrons, the Joy Theater opened its doors on Feb. 7, 1947 and was viewed as a “modern” movie house with its iconic neon marquee and original art deco architecture. Its conception and construction coincided with the apex of the film industry and heralded the optimism and economic expansion of post-was America. For over half a century, the Joy Theater stood as a premier movie theater in New Orleans, including one of the longest running films, the 1975 film “Jaws,” which ran for more than 20 weeks. First closing in 2003 then remaining closed after damage caused by Hurricane Katrina, the Joy finally re-opened its doors in 2011 when Allan McDonnel, Joe Jaeger and Todd Trosclair saw the potential of resurrecting the historic landmark and rebuilding the Joy Theater. Today, the Joy is dedicated to bringing world-class entertainment and community to the city of New Orleans and surrounding areas by forming a cultural bridge between the rich history of New Orleans and the city’s progression into the future. In 2014, the Joy Theater partnered with New Orleans promoter Winter Circle Productions, and in August of 2017, two years after WCP was acquired by AEG Presents to run its new Gulf Coast regional office, AEG signed a lease to operate the Joy, hiring all of the Joy’s key core staff as employees. The acquisition added the Joy to AEG’s portfolio of over 60 theaters and clubs and is another example of its strategy to partner with iconic venues in key music markets across the country. Operating the Joy has further strengthened AEG’s presence in the New Orleans market; they also produce the New Orleans Jazz & Heritage Festival, with WCP produce the BUKU Music + Art Project and about 200 additional events in New Orleans per year at venues including Joy Theater, Republic, Orpheum Theater, Mardi Gras World, UNO Arena and Smoothie King Center. AEG has also shown its commitment to safety through its partnership with WCP, implementing walk-through metal detectors at the Joy in 2017 – the first venue of its size in New Orleans to make this addition. Winter Circle Productions was founded in 2009 as an independent promotion and production company by Dante DiPasquale, while attending Tulane Law School, and Reeves Price, a recent Tulane University graduate. Creator of BUKU Music + Art Project (which just occurred on March 22-23 to a sold-out crowd of 20,000 people per day) and five-time recipient of the Offbeat Best Promoter Award, WCP will celebrate its 10 th year anniversary this Jazz Fest as one of the most trusted tastemakers on the Gulf Coast, having produced thousands of shows across many musical genres. Having created dozens of jobs, bringing in millions of dollars in tax revenue to the City and State, filling several local venues with content for a decade, and creating the Upbeat Academy Foundation (a non-profit organization providing local youth with opportunities to study music production and learn technical skills), Winter Circle Productions is truly a local New Orleans success story. As two transplants from the north, the WCP founders were inspired by the rich music culture of New Orleans and the infectious anything-goes entrepreneurial and creative spirit of the local community. That inspiration, along with the open-arms support of the venue operators at Howlin’ Wolf, Republic, Tipitina’s, Dragon’s Den and Maison, helped WCP push through the ups and downs of the early years, produce more and more shows per year, and eventually launch the BUKU Music + Art Project in 2012, which is now a nationally-recognized music festival with several sold-out years under its belt. After signing exclusive booking agreements with Republic and the Joy Theater to better compete and operate with more financial stability in order to producer concerts at larger venues, WCP was acquired in 2015 by AEG Presents, one of the largest live music companies in the world, to form and run AEG’s new Gulf Coast regional office, expanding WCP’s reach to cover Louisiana, Alabama and Mississippi. Still operating under the local Winter Circle Productions brand, WCP’s key accomplishments since its partnership with AEG and with AEG’s financial backing and national support have been signing a long-term lease at the Joy Theater including investing capital in cosmetic renovations, growing BUKU from 14,000 per day to 20,000 per day and increasing WCP’s full-time staff to 10 employees. For more information, visit www.thejoytheater.com.